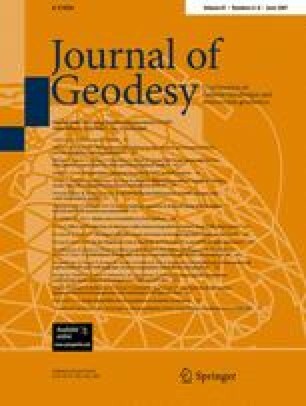 The contribution of the International VLBI Service for Geodesy and Astrometry (IVS) to the ITRF2005 (International Terrestrial Reference Frame 2005) has been computed by the IVS Analysis Coordinator’s office at the Geodetic Institute of the University of Bonn, Germany. For this purpose the IVS Analysis Centres (ACs) provided datum-free normal equation matrices in Solution INdependent EXchange (SINEX) format for each 24 h observing session to be combined on a session-by-session basis by a stacking procedure. In this process, common sets of parameters, transformed to identical reference epochs and a prioris, and especially representative relative weights have been taken into account for each session. In order to assess the quality of the combined IVS files, Earth orientation parameters (EOPs) and scaling factors have been derived from the combined normal equation matrices. The agreement of the EOPs of the combined normal equation matrices with those of the individual ACs in terms of weighted root mean square (WRMS) is in the range of 50–60 μas for the two polar motion components and about 3 μs for UT1−UTC. External comparisons with International GNSS Serive (IGS) polar motion components is at the level of 130–170 μas and 21 μs/day for length of day (LOD). The scale of the terrestrial reference frame realized through the IVS SINEX files agrees with ITRF2000 at the level of 0.2 ppb.